Living in the south, where it sometimes is warm enough to wear shorts in December, makes it hard for a midwestern girl to realize that winter is approching. Today, however, has me dreaming of a white Christmas. Today is misty and cold and all I can think about is “if it was only colder”. The weather is teetering on the edge between rain and snow flurries. I love snow. I always have. So during December, January and February, I want snow. I want that fresh, clean smell that comes with it. I want the quiet that comes with it. I want the beauty of it. I want to experience it and I want my students to have that same opportunity. Short of arranging a field trip to fly out to Jackson Hole, Wyoming where I try to go each winter to get my snow fix, I at least have some snow themed fun for my students on our cold (below 50 degrees) winter days. 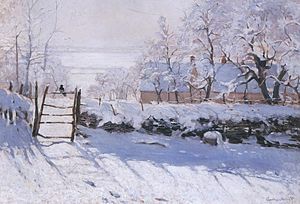 We are a Discipline-Based Arts Education (DBAE) school so I do a lesson on Claude Monet’s Magpie painting. We look at the painting, we discuss what we see in it and what makes it look cold. We use words to describe it and use those words to write about it. Finally, after several days of looking at different elements of the painting, we paint it. This ends our formal lesson on our winter theme. For the more whimsical side of winter we turn to the snowman. Children love them so watch them, read about them and we make them. First we watch the movie “The Snowman” narrated by David Bowie and based on the wordless book by Raymond Biggs. Later we recreate our own pencil drawings of a snowman. This year we are going to read “Snowmen at Night” because I found a cute writing/art activity on Pinterest pinned by thefirstgradeblogspot.com (if you don’t know about Pinterest, you need to explore it….so many cute teaching ideas!). In the science center we’ll use a science kit and make snow. I am always amazed at how realistic it is…cold and soft. We’ll also fill a white dishpan with white packing peanuts and animals to find the ones camouflaged in the “snow”. 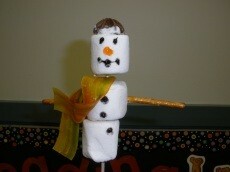 For pure fun we’ll make snowmen on a stick for a snack and rock angles on the playground. Years ago, when I taught kindergarten, we brought hats, scarves and gloves and made snowmen costumes out of white trash bags filled with newspapers and then took silly snowmen pictures. My first graders are too big for the trash bags so we’ll bundle up in our jackets, hats and gloves and have a snowball fight with recycled paper snowballs and finish our snow play day with hot chocolate and fried biscuit donuts. Snow always brings back childhood memories for me and maybe, just maybe, this will be the year when it actually snows and my students can begin their own memories of the cold, white stuff. This entry was posted in Notes from the teacher's desk and tagged Claude Monet, David Bowie, DBAE, Discipline-Base Arts Education, education, Insta-snow, Jackson Hole, Magpie, Notes from the teacher's desk, Raymond Biggs, snowman costume, snowman pops, Snowmen at Night, The Snowman. Bookmark the permalink.